As per the recommendation of the Sanskrit Commission (1956-57) the Government of India established the Rashtriya Sanskrit Sansthan on 15 October , 1970 as an autonomous body, for the development along with the dissemination of Sanskrit and the implementation of the Central Government’s policies and programs regarding Sanskrit . Considering its multifarious importance in May 2002 the Ministry of Human Resource and Development , Government of India , has declared it a Multi Campuses Deemed University . At present total 12 campuses of this deemed university are working in different states of India among which, from the session 2002-2003 , the Bhopal campus is being run in the capital city of M.P.- Bhopal. Bhopal is a city which is well flourished in the aspects of natural, intellectual, literary, historical and political wealth from the ancient times. So the MHRD Govt. of India issued the establishment order no. Sasnkrit-1-section dated 31st March 2002 to establish the Bhopal campus in the city. For the implementation of this government order the RSKS New Delhi started the Bhopal Campus from 1st July 2002, as per the letter no.- 37021/2002-admin/1108 office order no. 107/dated 5.6.2002, by providing the principal and other departments etc. Though 10 years before this date, in 1991-92, by the declaration of the then minister of Human Resource and Development Ministry Govt. of India, Honorable Shri Arjun Singh, the planning of this Bhopal campus had been decided and at that very time the Govt. of M.P. had given 10 acres land at free of cost, for the development of this campus through the Govt. order letter no- F 6730/ Govt./Sa-2B/93 dated 27.05.1993/20.7.1993. Thus, from 6th July 2002 in the room provided in the Barkatullah University Guest House the Bhopal Campus activities were started and from 2nd August 2002 the admission of the students and the teaching activities were started in a rented building in Arera Colony. The formal inauguration of the Bhopal Campus was declared on the date 16th September 2002 by the then Governor of M.P. Honorable Bhai Mahaveer ji in the presence of the then V.C. RSKS New Delhi Prof. Vempati Kutumb Shastri ji , the founder Principal of the Campus Prof. Azad Mishra ji and the other reputed scholars of the Sanskrit world. After that the then chief minister of M.P. Honorable Shri Digvijay Singh ji laid the foundation stone of this campus building on the allotted land plot on 27.02.2003. The foundation stone of the main administrative building was laid by the then minister of MHRD Honorable Shri Arjun Singh ji on the date 19th September 2005 for the further development of the Campus. Then in the presence of then VC Prof. Radhavallabh Tripathi the newly built main building was named as the Vatsaraja Bhavan on the date 24.03.2010 i.e. Wednesday Ramnavami and all the campus activities were started in this Vatsaraja Bhavan from that day.At present in this Vatsaraja main building all the classes , laboratories , non formal classes , departmental libraries , correspondent open education centre , Natya shastra research centre, meeting hall and fully equipped auditorium are available. Along with these a systematic Vararuchi Grathagar (Central Library) and an air-conditioned Bhavabhuti Prekshagar (Auditorium) fully equipped with audio visual facilities too are available. In this buiding the guest room, teachers’ room and rooms for the HODs are also given as per the rules. Apart from these a boys’ hostel for 333 students, girls’ hostel for 108 students, guest house, principal and employees residence have been provided in the campus. 1. The campus is running 6 departments including- Sahitya, Vyakaran, Jyotish, Jain Darshan and Education with the Modern Subjects Department. The courses offered include Prakshastri, Shastri, Acharya, Shiksha Shastri(B.Ed. ), Shiksha Acharya(M.Ed. ),a separate certificate course in Jyotish(3 months), Diploma in Vastushastra and Vidyavaridhi(Ph.D.) in different branches of Sanskrit knowledge. For the training of the physical education a modern gymnasium along with play ground is provided to the students. 2. The Mukta Swadhyay Peeth is working in the campus for providing Sanskrit education to the people who want to learn Sanskrit. 3. The campus Vararuchi Granthagara(Central Library) maintains a rich collection of many references , journals , books, other magazines and news papers. 4. 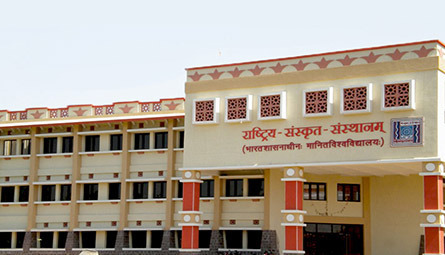 The campus possesses well equipped Computer , Jyotish , Language and Psychology laboratories for the advance studies in Sanskrit. 5. The well maintained open air theatre is built in the campus premises which can accommodate 300 people at a time. 6. Bhopal Campus runs the unique Natyashastra Anusandhan Kendra which works on the theatrical presentation of the Sanskrit plays and dramas . It records and prepares the audio CDs of the Sanskrit songs and slokas. 7. The Bhopal Campus publishes two ISSN journals namely Rashtri and Shastra Mimansa. The yearly departmental publications are also there in all the departments of the campus. 8. From the session 2016-17 the NSS program has also been introduced in the campus. The essential process for the same has been started. Thus this Campus is striving hard to achieve the decided goals for the development of the Sanskrit Education.